According to EPA estimates, 75% of the waste generated in the US is recyclable, however only about 30% of it is being recycled – the rest ending up in landfills. With cities looking to increase recycling programs and reduce landfills and other waste, many projections show municipal recycling programs doubling or even tripling by 2020, meaning investments in facilities and equipment. With the municipal investment required for recycling initiatives, efficient and cost effective operations are a must. Original equipment manufacturers (OEMs) and recycling facilities rely on products that endure the abusive nature of the recycling environment. Efficient movement of material through a system is critical with the ever-increasing expectation for recovery rates, so the right components on systems are critical. Because of the diverse mix of materials that are processed at these facilities, and the increasing complexities of today’s sorting equipment, system needs vary from standard products for sorting lines to customized products like eddy currents and magnetic separators. 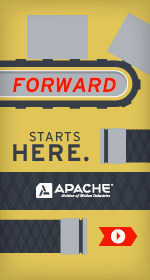 From clean-up to continually efficient operations, you can expect the highest level of performance from Apache products. As a major supplier to the recycling industry, Apache has the technical expertise to drive continuous improvement ─ with many of our products conceived and customized exclusively for material recovery systems. Our ISO 9001:2008 certified facilities have produced thousands of belts, hoses, and cut rubber parts for all kinds of recycling systems and environments. We have built our reputation in the recycling industry, because we understand the needs at all levels of the process. Whether working on the MRF floor, or working to design unique belting and custom cut or molded rubber parts at the OEM level, we can provide unique insight into what products you need to get the job done right. Regardless of the recycling application — single stream, construction & demolition (asphalt, concrete, rebar), plastic separation, wood products, composting, scrap metal, e-waste (computers, TVs, etc. ), and municipal solid waste — the right belting, hose, and molded rubber products on the systems are what drives efficiency and profitable results for our customers.